Rohan and his family are on a guided tour to Europe, which means it was a group departure from India. The group which is an amalgamation of loud aunties and blunt-opinioned uncles sidelining a few kids like Rohan. A passionate photographer, he is out there for a reason. Not making friends like most kids of his age would like to, instead, click tons of pictures to participate in the Photo Essay Contest back at school. Rohan finds solace in his own company. He gives nicknames to his annoying fellow travellers. The bleeding mouth Uncle, Thermometer Aunty, Miss Bananas, Unsmiling Assasin and the Thoo-Thoo Uncle are the ones we become familiar with, their characters being revealed under hilarious situations. Not just them, his parents too are highly relatable as told from an Indian perspective. Rohan who is focussed on winning the Photo Essay Contest faces an earthshaking situation during the tour. His camera goes missing and that’s just the beginning of his troubles. 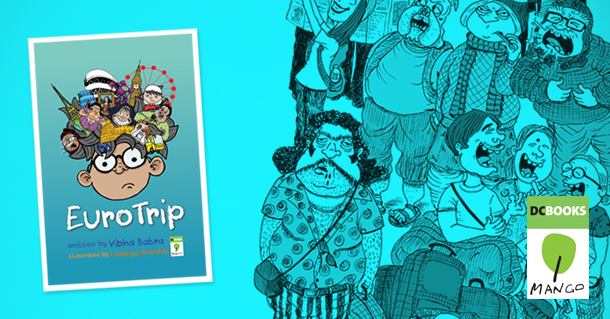 Eurotrip written by Vibha Batra is a tale of learning and unlearning leaving us with a signature experience of places, people and situations uncalled for.